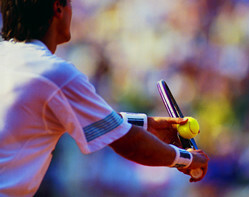 Tennis elbow or medically termed “lateral epicondylitis” is a painful inflammatory condition affecting the outer elbow. The name “tennis elbow” suggests that the condition is limited to tennis players only. Surprisingly this is untrue and is particularly common in labourers, squash players, computer operators etc. However, it has been found to affect approximately 1 in 20 tennis players. Pain occurs in the outer bony part of the of the elbow and may be exquisitely tender to touch. This pain may be referred down the back of the forearm into wrist and hand. The pain is usually made worse when gripping, turning a tap, opening a door, picking up objects, shaking hands and of course playing tennis, particularly backhand shots. The disorder is usually an overuse injury which develops over time but may suddenly occur following an unaccustomed amount of wrist extension activity. Pain occurs when excessive tension causes small tears to develop within either the extensor tendons or at the attachment of the wrist extensor muscles to the outer bony prominence of the elbow (lateral epicondyle). The pain experienced is due to inflammation at this point. A brace maybe worn around the upper forearm during activity to help decrease tension at the inflammatory site. Elbow straight, twist arm inwards, bend wrist so hand pints outwards, pull on back of hand. TIP- See your physiotherapist to be prescribed the correct stretch and the right amount to do!